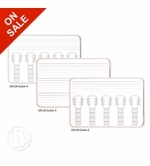 Handheld dry erase music boards or music lap boards from OptiMA Inc. are all made and printed in the U.S.A.
We have a great selection of small 9" x 12" or slightly larger 12" x 18" handheld dry erase music boards with images such as simple music staff lines or music staff lines and a piano keyboard. 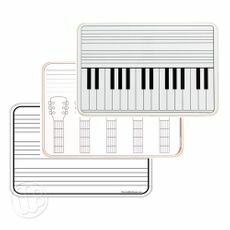 We also have a handheld dry erase board to help students learn how to play the guitar that shows guitar frets along with music staff lines. 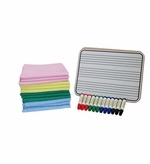 Which ever handheld music lap board you select you can rest assured knowing that you've purchased one of the best dry erase and erasing surfaces available. 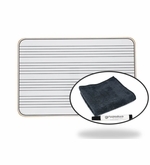 The print is permanently protected under our exclusive crystal clear dry erase surface and it will never rub or wipe off like other printed lap boards. Double Sided 9" x 12"
Double Sided! X-Large 12" x 18"
Double Sided X-Large 12" x 18"
12 Double sided lap boards, markers and wipers.